WordPress premium business directory theme. DirectoryMarket is a Premium Wordpress theme that lets you transform your wordpress website into a genuine business directory website. It is a turn-key and you can have a business directory website app at your fingertips. DirectoryMarket is a premium business directory and listing theme for WordPress. The professional design and rich feature character of DirectoryMarket, makes it on of the best listing or directory themes on the market today. 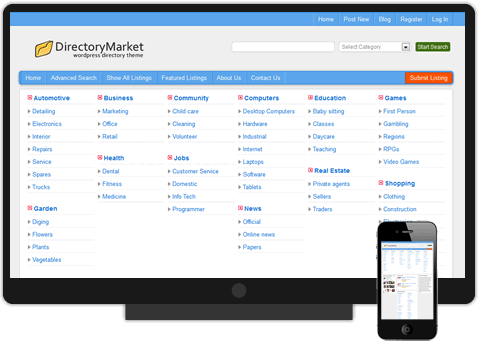 Based on the sitemile framework, DirectoryMarket theme is easy to use, easy to modify, easy to run and you will be up and running a directory website in minutes from buying. Also our support is one of the best on the market as well, we offer phone, forums, email, and live chat support so we can please even the most exigent of the customers. You want to see how this theme performs before you buy it. Why not go to the online demo and test drive it. Use the button on the side to share this page on your twitter account.